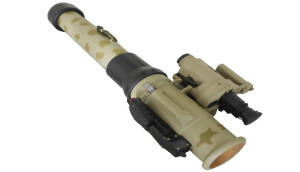 The modern RPG-32 lightweight, multi-purpose rocket launcher was designed sometime around 2005 by the Russian state-owned NPO Bazalt (Joint Stock Company Scientific Production Association “Bazalt”) and is described as a joint Russian-Jordanian development. Jadara Equipment & Defence Systems, a joint venture between the Jordanian Specialized Company for Electronic Services (JSCES) and the state-owned King Abdullah II Design & Development Bureau (KADDB), opened a facility on 30 May 2013 to produce the RPG-32. The Jordanian-made RPG-32 systems are designated Nash-shab (the original name was ‘Hashim‘), and are assembled from kits that are supplied by Russian manufacturer Bazalt. The RPG-32 launch device is compact, weighs approximately three kilograms, and is described as having a lifespan of some 200 rounds. It is also fitted with a night vision device. The RPG-32 is capable of firing two different rocket types, each weighing approximately 7.5 kg. The ATG-32 (Russian designation PG-32V) is a tandem-warhead high explosive anti-tank (HEAT) munition, whilst the TBG-32 (TBG-32V ) is a thermobaric munition designed to engage manpower, light vehicles, and structures. Whilst earlier models of the RPG-32 were designed to be capable of firing both 105 mm and 72 mm rockets, the Jadara website presently lists only the 105 mm variants. 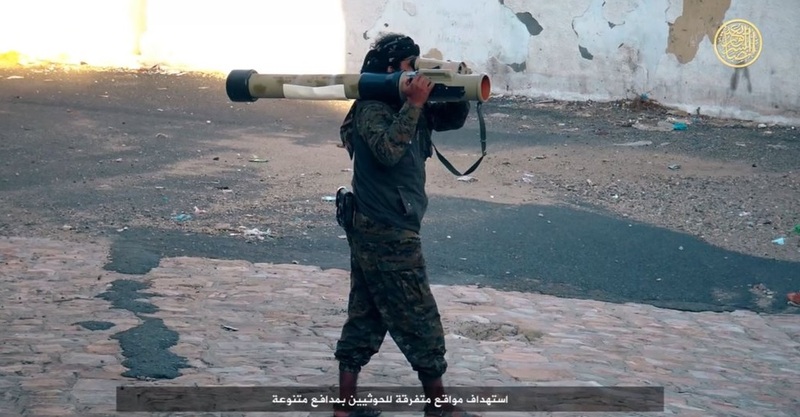 Ansar-al Shari’a fighters are seen employing a Jordanian-made RPG-32 system, launching an ATG-32 rocket. This The launch device is fitted with an advanced GS-2R day sight, rather than the standard 1P81 model. The GS-2R is fitted with a laser range finder, temperature and pressure sensors, and a ballistic computer, enabling the user to employ the weapon with greater precision. It is unclear how such a modern and comparatively advanced weapon found its way into the hands of a terrorist group. There are only two known users of the RPG-32 in the region; Jordan, where the weapon is produced, and the United Arab Emirates, who recently purchased some 400 units. Interest in the system has also been shown by the armed forces of Pakistan, Libya, Lebanon, and Iraq. Both Jordan and the UAE are part of a Saudi-led coalition fighting against Houthi forces in Yemen. Whilst UAE forces, including special operations forces (SOF), have openly taken part in ground operations, Jordan has thus far refused to confirm the presence of ground forces in Yemen. 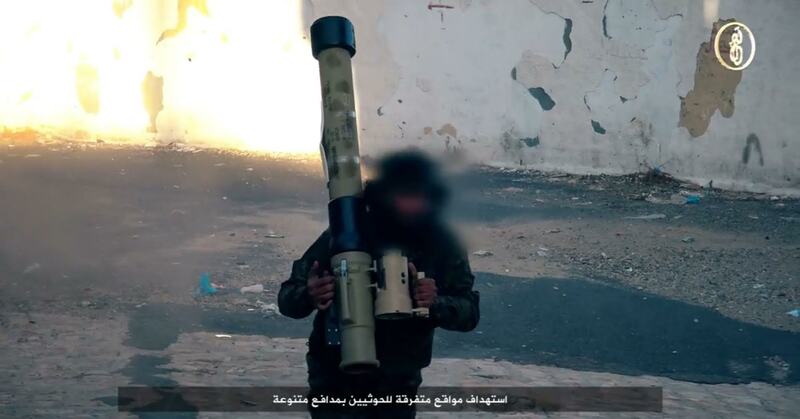 RPG-32 systems may have been captured directly from Jordanian or Emirati forces on the ground, however there are other more likely avenues of transfer. In late 2015, coalition forces began to “transition from a high-visibility ground combat role to training and supporting Yemeni forces on the battlefield”, conducting sizeable train-and-equip missions and supporting Yemeni forces with SOF and close air support. Yemeni forces, including both armed forces loyal to President Hadi (the ‘New Yemeni Army’) and more ad hoc ‘popular resistance committee’ armed groups, have both been equipped with new arms and munitions provided by coalition forces. ARES has previously examined significant numbers of Bulgarian AR-M9F rifles provided to Yemeni forces by the UAE, for example. It is possible that the RPG-32 has been supplied to Yemeni forces and captured by Ansar al-Shari’a militants, or that terrorist elements have infiltrated popular resistance committees and obtained new sources of arms and munitions in that way. 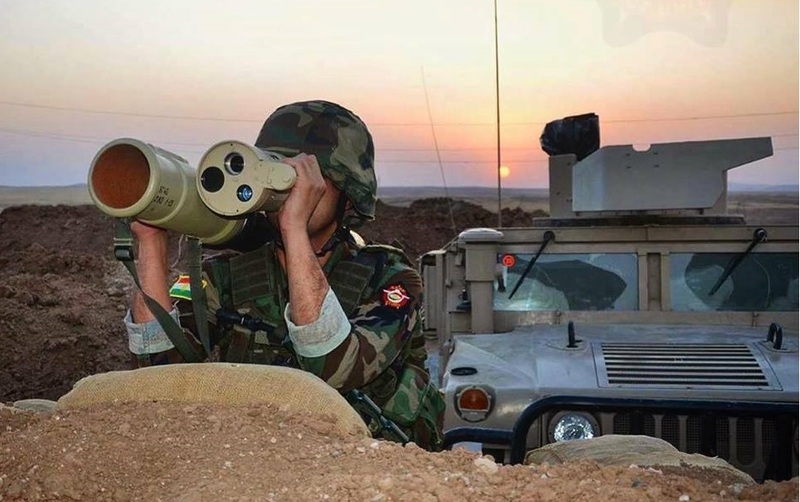 Update 01/04/2016: Thanks to reader ‘luftmausmann’ who sent us a link to an image shared on a web forum which appears to show Kurdish forces in northern Iraq equipped with an RPG-32. This was first posted on the Facebook page of the Kurdish Counter-Terrorism Unit (CT UNIT) in July 2015, and other images have since emerged. The photo below, posted to the CT UNIT Facebook page on 27 February 2016, shows a CT UNIT member with an RPG-32 fitted with a GS-2R day sight. RPG 32 in use by peshmerga? So how about the possibility that UAE / SAUDIS actually deliver arms directly to al-qaida, like they do in Syria too, among all the other islamic terrorist they founded/funded/armed/supported, aq in Yemen is after all, a Saudi proxy, also these “popular resistance”, its just a “pr front” to enable arming islamist terrorists, like aq, very much like mystical “fsa” in Syria.